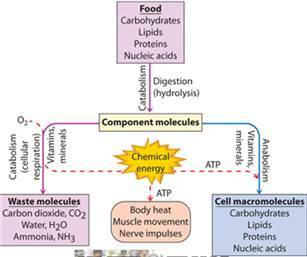 The Main Idea is to expose you to the four main classes of Biomolecules (Introduction to Biochemistry). When we absorb molecules from food we eat and either use them for energy or incorporate them into various structures that give our bodies both form and function. Interestingly, no molecule in a living organism is a permanent resident; rather, there is perpetual change as ingested food molecules are transformed and utilized to replace older molecules. Within a decade, most of the molecules in a human body have been replaced by new ones --- the body you have today is literally not the same body you had seven years ago. Although your molecules are continually replaced, the genetic code that guides the assembly of those molecules is pretty much the same. This is similar to what we see with identical twins who are made of different molecules but share pretty much the same genetic code. No one would claim two identical twins to be the same person. Similarly perhaps you are as different from your past self as identical twins are from each other. Perhaps an individual’s identity is not static; but is continually re-established every moment (dynamic). The last video gives a great summary of is a healthful diet. So: what do you eat is the question? 2. The student will prepare a table breaking down the foods in five of the six categories of body nutrients: Fats (Saturated & Unsaturated [trans & Cis]), Carbohydrates (Digestible and nondigestible), Proteins, Vitamin, and Minerals (excluding water: Water,). included in the list above. 4. The totals for each category should be computed as well as the total calories for each food consumed. 5. The daily total should be computed. If possible the student could extend the project into a “normal” day and an “abnormal” day.